We are pleased to be presenting two events at the National Council of Teachers of English annual conference in Houston, Texas. Yonty Friesem and Renee Hobbs present their research, "Imitation and Originality in Youth Media Production." 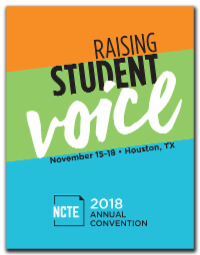 Strange as it may seem, it is the only event at NCTE 2018 with the word "propaganda" in the title! There’s never been a more important time to analyze contemporary propaganda. Explore Mind Over Media, a crowdsourced digital platform with thousands of examples of propaganda. Use the power of online learning to promote face-to-face dialogue and discussion that promotes intellectual curiosity.